Arthritis is a condition which affects around 10 million people across the UK of all ages. It’s a condition which causes both pain and inflammation around joints and in fact, there are around 200 different musculoskeletal conditions which are related closely to or are in fact types of arthritis. Below is a closer look at the five key groups of musculoskeletal condition effecting people across the country. Often known as degenerative as well as mechanical, this group of arthritic conditions is categorised as having damage to the cartilage as the main problem behind the condition. Cartilage attaches to the ends of bones and helps joints move smoothly without discomfort. With this type of arthritis the cartilage thins and roughens, leaving the bone unprotected and as a response bones often attempt to repair and grow awkwardly, altering the natural shape of the joint. 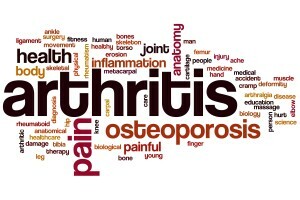 This is the condition usually known as osteoarthritis. Osteoarthritis is more common amongst older people as it effects joints which have been heavily used throughout a lifetime. Osteoarthritis can also be caused by a fracture or previous inflammation to a joint. Back Pain is a very common condition which often isn’t indicative of arthritis but sometimes can be. Osteoarthritis can occur in the spine as spondylitis and equally painful is the inflammation and discomfort caused by a slipped disc. Osteoporosis can also be behind back pain. Connective tissues are the ones that support and bind together the key organ and bodily tissues throughout the human anatomy. Tendons, ligaments and cartilage are examples of connective tissues and their proximity to many joints means that when they become inflamed or damaged it can effect the joint, cause swelling, pain and the need to seek treatment. Examples of connective tissue diseases include Lupus and Scleroderma. This term is what is used to describe the pain you feel in tissues other than your bones and joints. It usually comes from the muscles and soft tissues that support the joints. This type of pain is usually focused on a single area of the body such as tennis elbow which results from over use of this joint. If the pain is more widespread and associated with other symptoms it can lead to a diagnosis of fibromyalgia.